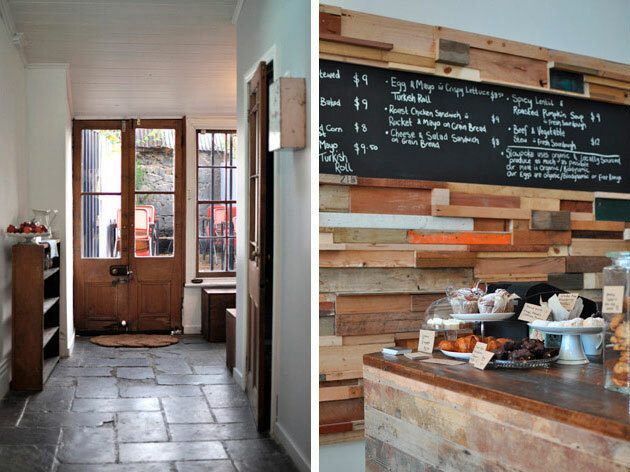 See if you recognise the cafes below. 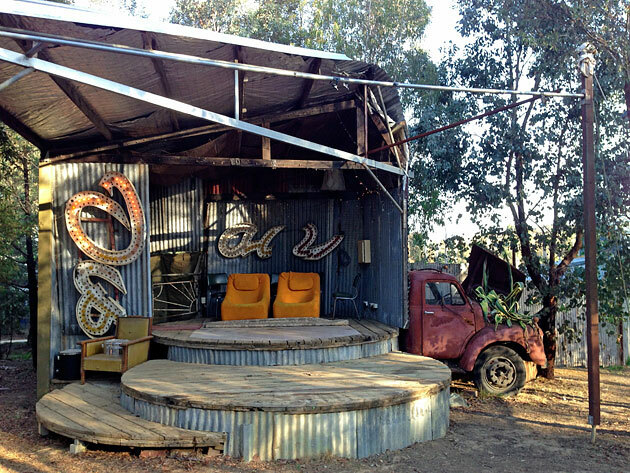 You may have seen pics in design magazines or social media, but I wanted to revisit them here because they align so well with the spirit of The Junk Map. 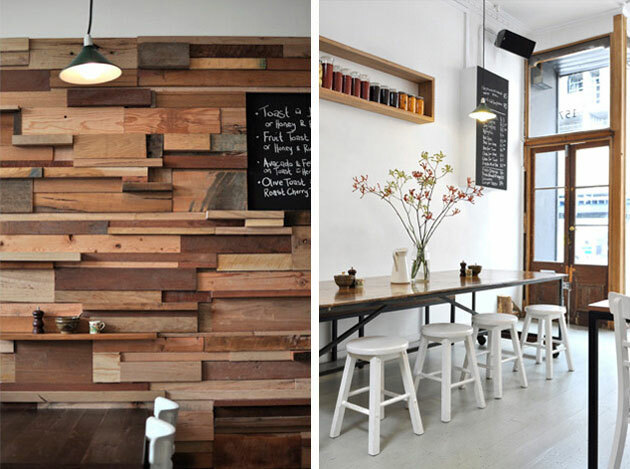 Each fit out combines recycled materials, thoughtful design, and a low-footprint build to create an atmospheric space with distinct personality. The mind behind Sasufi is Anne-Sophie Poirier, a multi-skilled designer with interests across a range of disciplines including architecture, graphic design and photography. 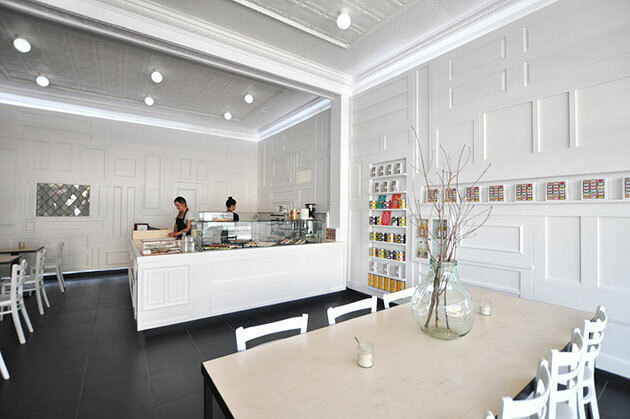 Her folio projects show a natural gift for illustration and storytelling, and all three of these cafes incorporate a graphic wall treatment that sets the tone for the entire space. Rustic timber always speaks to me and I absolutely love Slowpoke. The huge patchwork wall first caught my eye on Pinterest and I was excited to discover it wasn’t somewhere overseas but actually here in Melbourne. 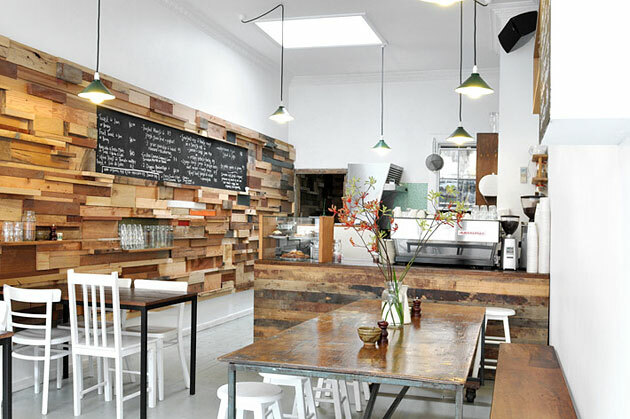 The wall is made from recycled timber offcuts and was built by handy friends of the cafe owner who cut, glued and screwed each piece to a timber backing. Every square metre took hours to assemble but their painstaking work was rewarded with a beautiful textural feature that’s been shared in design blurbs around the world. Anne-Sophie included several shelf sized pieces for storage, and the rough-hewn effect is heightened by the occasional flash of painted timber. Doesn’t the orange board look great behind the cake counter in the pics below? 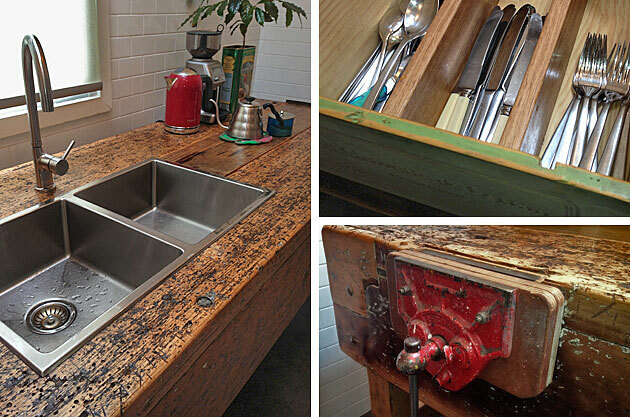 The rest of the low budget fitout includes recycled floorboards on the counters and inexpensive secondhand furniture. Painting mismatched chairs all one colour is a design trick that works really well here where they mirror the uneven wall. Le Petit looks more conventional but, to me, there are two elements that differentiate it from busy competitors. 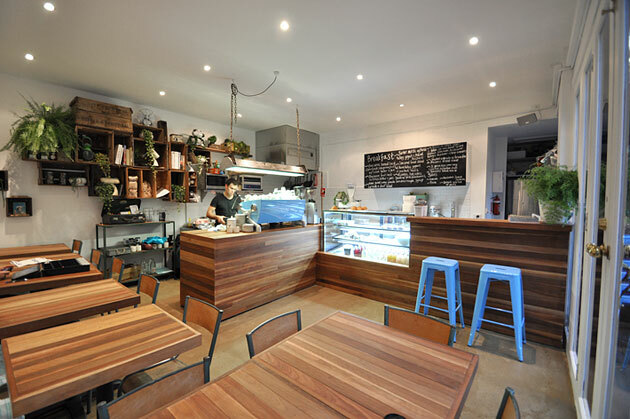 The multi-hued recycled timber on the counters and table tops provide warmth and an elegant linear framework. And the real magic is the styling. 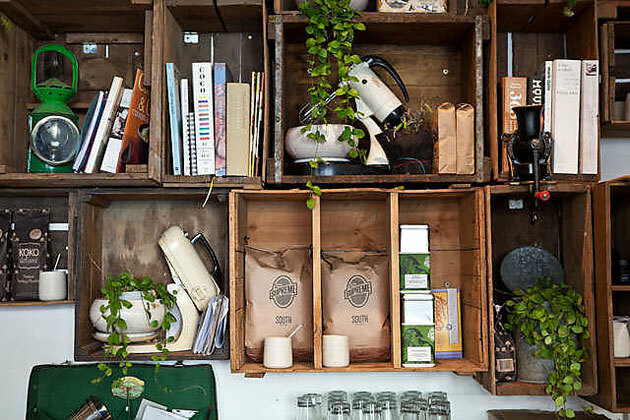 Vintage metal school chairs, industrial trolleys, antique homewares and a feature wall of old crates and greenery give a casual feel that says settle in, relax and enjoy a second cup of coffee among friends. Image by Le Petit Prince. 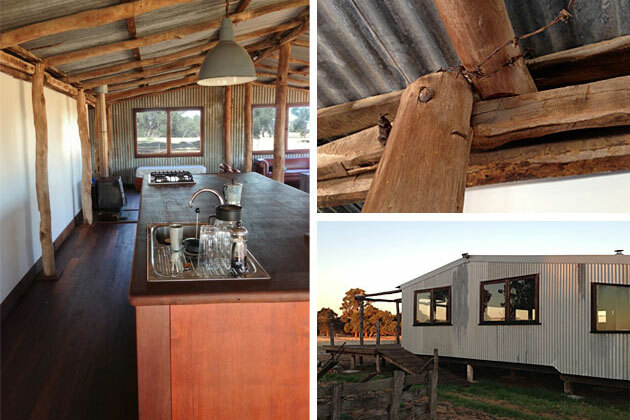 If rustic or recycled timber is not your thing this project uses similar components but presents them in a completely different way. Once again Anne-Sophie uses a wall feature to anchor her design but this time the effect is sophisticated, chic and gently feminine. So what’s recycled? Take a look at the white walls. They are a meticulous patchwork of old timber doors! What I like about this salvage jigsaw is the maze-like effect that keeps your eye moving around the space. Far more interesting than any conventional wall treatment. 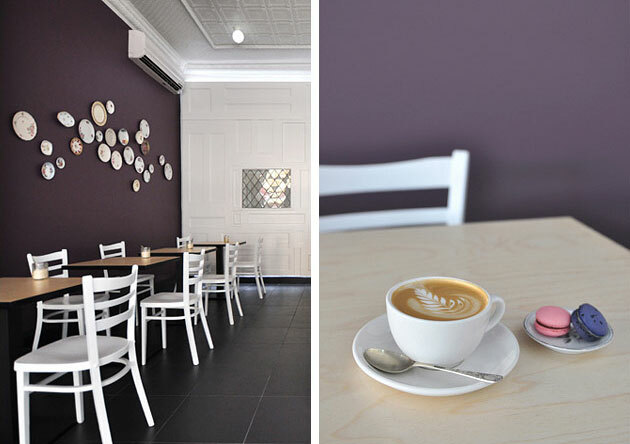 On the other side of the cafe the bright white is contrasted with a rich purple wall, simply decorated with recycled vintage plates. 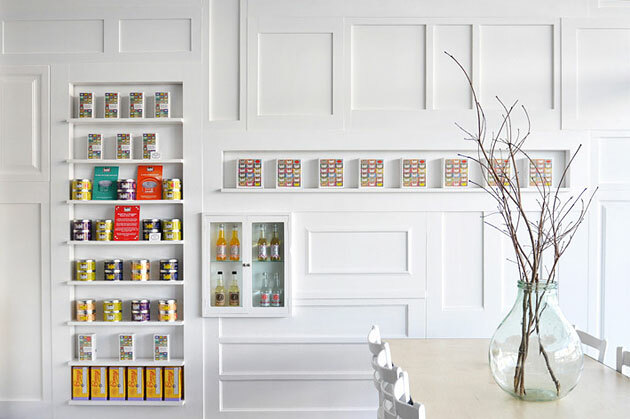 By Josephine sells gorgeously colourful French macarons so the pretty floral plates, and the bright tea packaging around the walls, compliment the sweet treats on the counter. 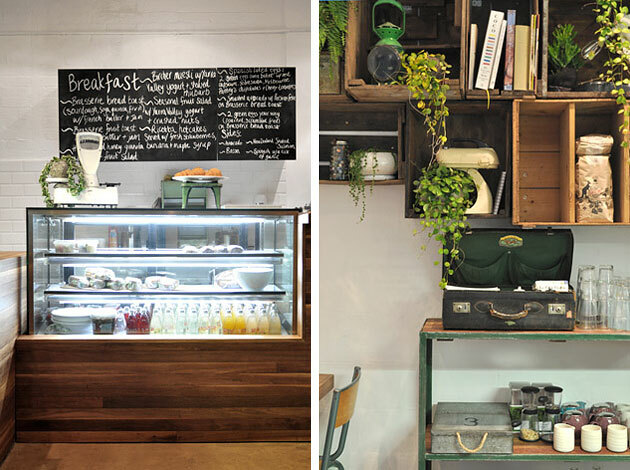 Small businesses in Melbourne are embracing the recycled / vintage / industrial trend because it’s cheap, homely and fun to play with. These projects show that good design and a little imagination can take the concept even further. Note: All images (except one) are by Sasufi, reproduced with permission.